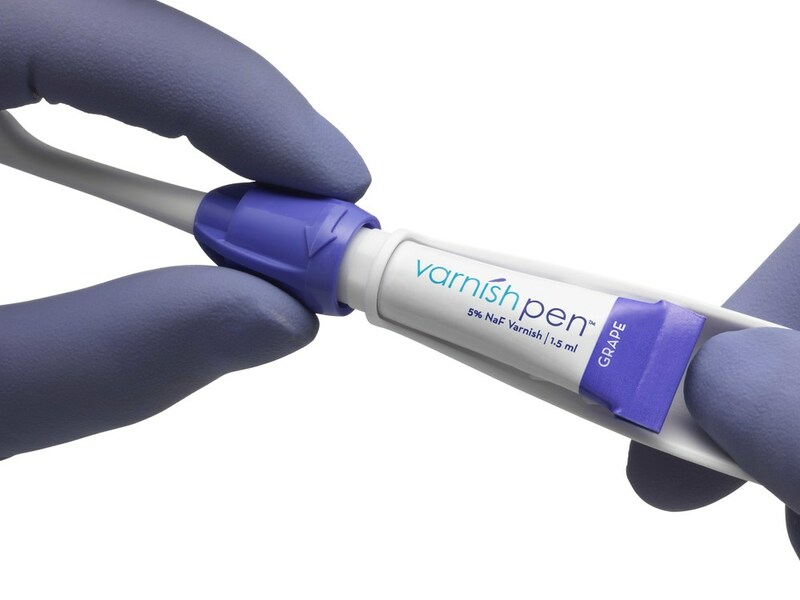 Varnish Pen 5% Sodium Flouride Varnish is an innovative, all-in-one system that sends varnish from brush-to-teeth with a quick twist and easy press. 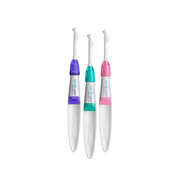 The single-dose unit replaces foil packets and brush sticks for quick, simple, mess-free application. 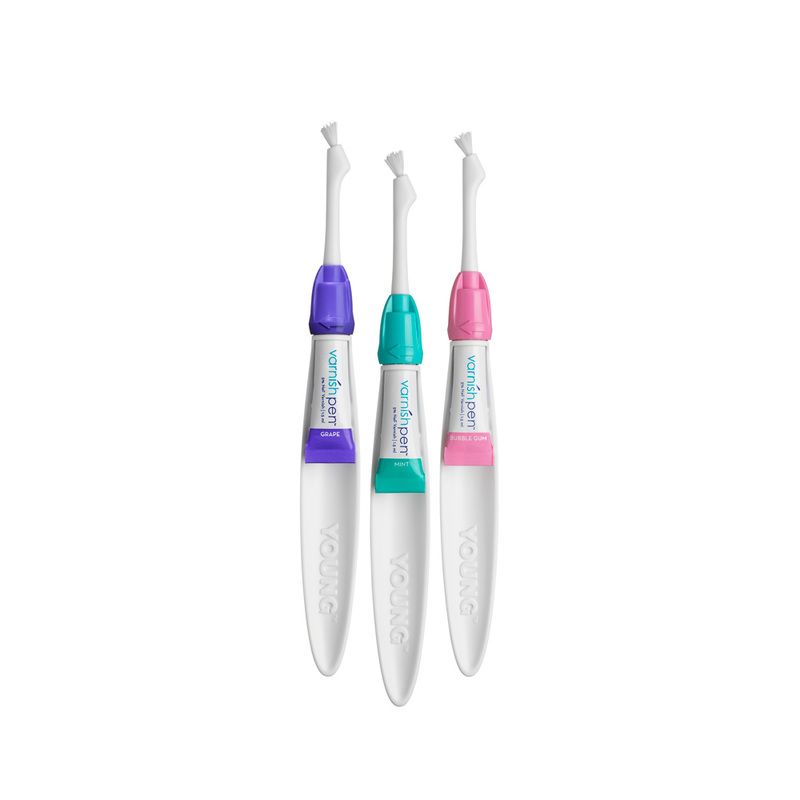 The thin, translucent no-mix formula is easy to handle without stringing or clumping and available in mint, bubble gum or grape. Q: Why is there more plastic in the Varnish Pen handle versus a brush stick? A: The Young Varnish Pen handle shape is wider and longer than a typical brush stick to offer better leverage and ergonomic comfort. We designed the handle to prevent hand strain and keep you feeling healthy. Q: How is the Varnish Pen varnish formula different from other varnishes on the market? 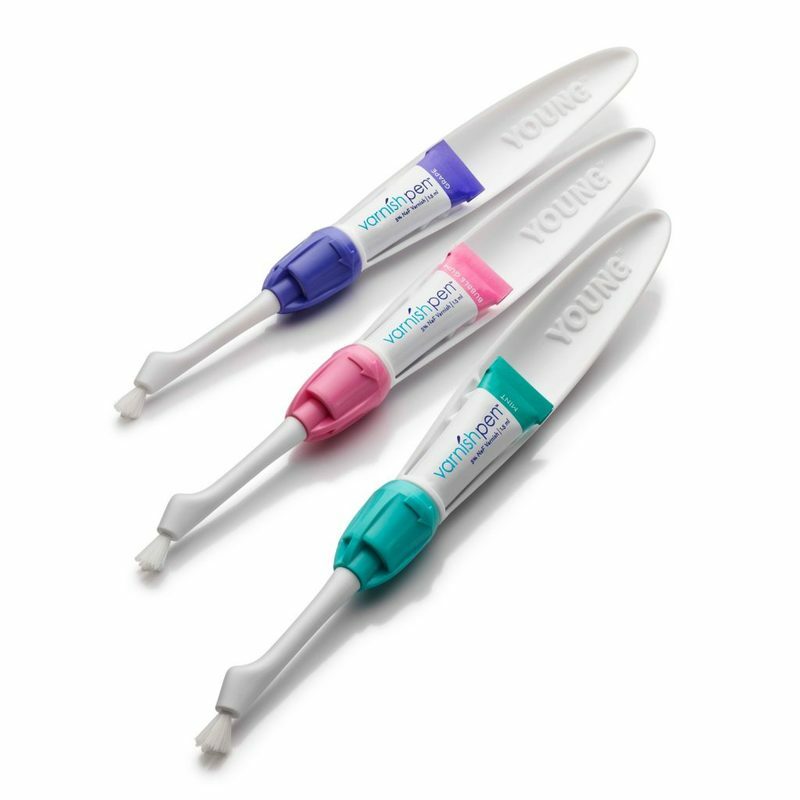 A: The Varnish Pen varnish formula is a clear 5% sodium fluoride varnish, but thinner than most to ensure an easy flow through the SmartFlo™ brush tip. With no clumping or stringiness, the mildly flavored formula offers improved patient acceptance. Q: Do teeth need to be dried prior to application? A: No, teeth should not be dried prior to application, unless there is excessive moisture. Saliva helps to set the varnish. Q: Which tooth surfaces should I apply varnish to? A: You can make a judgment call here, but we recommend applying varnish to all tooth surfaces for maximum benefit. Especially since Varnish Pen makes application so quick and easy! Q: How do I control the flow of varnish? A: After turning the dial to activate, gently press the tube until varnish appears on the bristles. Continue to press the tube to release more varnish while brushing tooth surfaces. To pause or stop the varnish flow, simply release. Q: Why are the bristles of the Varnish Pen longer than a typical varnish brush? 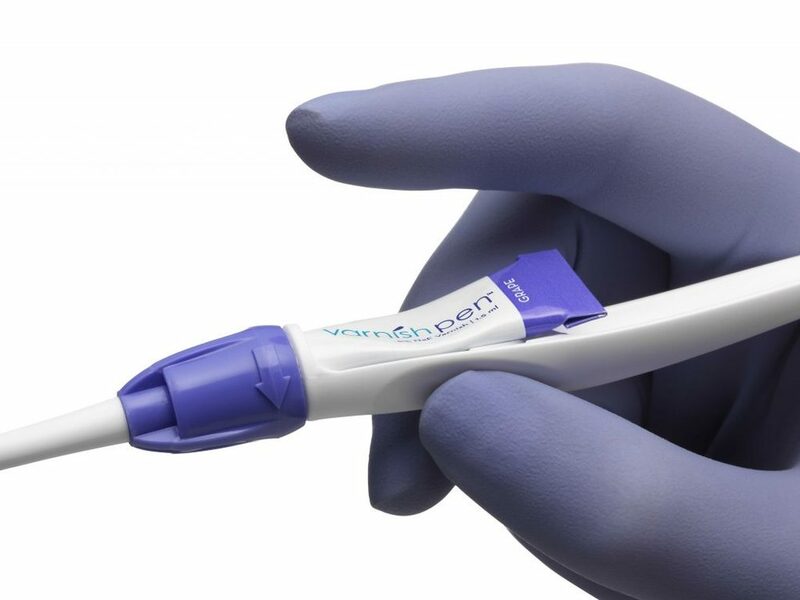 A: The Varnish Pen SmartFlo™ bristles are longer to provide better tooth coverage when applying the varnish – making the application process even faster! Q: Why do I have varnish leftover? A: The Varnish Pen is designed for adults (who need more varnish coverage) or children (who need less). Having ample varnish (and a little leftover) is necessary to ensure a quick and easy flow through the SmartFlo™ brush tip. There is no need to squeeze hard to get the last few drops of varnish out. Save that tiresome job for your toothpaste! Q: Is Varnish Pen single-use? A: Yes, this is a single-unit dose application. Q: Is Varnish Pen recyclable? Yes, you can recycle Varnish Pen! 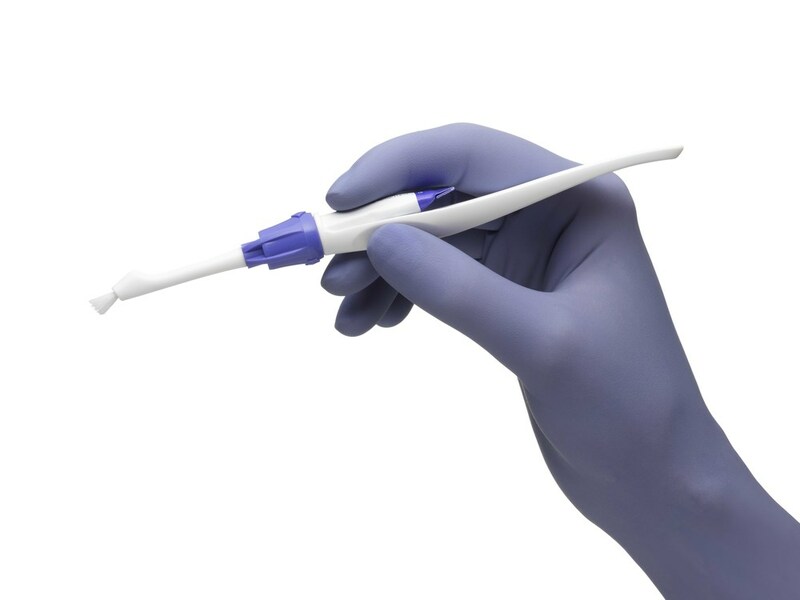 Simply twist-off the contaminated brush tip (dispose of separately) and recycle the tube and handle. Q: How long should varnish be left on teeth and can patients eat or drink? A: Varnish should be left on for at least 4-6 hours for maximum results and during that time hot liquids, hard food and alcohol should be avoided. Cold liquids and soft foods are fine directly after treatment.